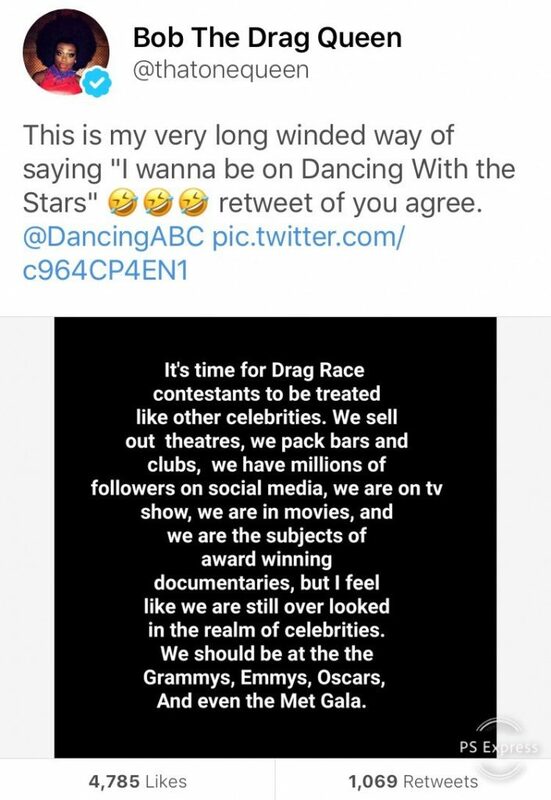 Now I vaguely remember a few drag queens joking a bit in the past about wanting to do the show, but I feel like this is the first instance where one of them actually seems serious about it. Bob’s got a point – with the success of RPDR in the last ten years, drag queens are becoming much more well-known in the mainstream, as opposed to being considered more of a subculture/niche celebrity. They’re starring in Oscar-nominated movies (Willam and Shangela were in A Star is Born), TV events (Valentina is set to play Angel in Rent: Live this Sunday), and Netflix original content (Ginger Minj was most recently in Dumplin’, while Alyssa Edwards’ reality show Dancing Queen follows her dance school in Texas, and many of the voices in the cartoon Super Drags are former RPDR queens). Drag queens are having a moment – so perhaps it’s time for DWTS to give one a shot. I’ve said it already, but I think season 28 is going to be a make-it-or-break-it season for this show – I think they’ve got to somehow revamp it, while also hanging onto their core fanbase. I think attitudes have changed (and continue to change), and while I’m sure there would be some obnoxiously-vocal bigots threatening to boycott the show if a drag queen was on, I think it could be cancelled out by the influx of new viewers the show could potentially get from casting a queen as famous as Bob. Potential caveats? I assume Bob would be competing in drag, which means she’d be dancing with a male pro – and Bob is easily 6’2″-6’3″. That’s at least as tall as Keo, our current tallest male pro, and I assume Bob would also be wearing heels. I think it’s safe to say lifts are probably out 😛 Other than that, I can’t see too many logistical barriers…what do you guys think? I know I say this a lot anymore, but I just want to see something I haven’t seen before…so I’m all about Bob on DWTS 😉 Be sure to vote in the poll below! UCLA Gymnast Katelyn Ohashi For Dancing with the Stars? ?